The Making Sense of Trauma webinar will help you learn how to use a trauma-informed perspective to better understand the relational, neurobiological and developmental impact of trauma on children and youth. This 3rd printing of Big Feelings Come and Go is available for $9.95 plus tax (includes shipping). Books can be ordered at the Canadian Centre for Child Protection . Free Downloads – Posters of Freeze, Flight, Fight and Feeling Safe and Settled and the PDF version of the book . Check out videos of the Freeze, Flight, Fight and Feeling Safe and Settled on the Protect Children Youtube channel. 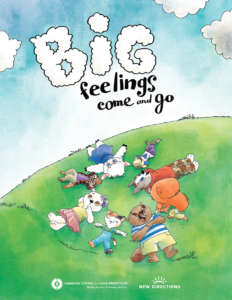 Big Feelings Come and Go is a storybook we hope will be a resource to help families and caregivers have conversations with kids about freeze, flight, and fight and learn some basic self-regulation skills. We wanted to help create a book for kids to help them better understand how and why their bodies respond the way they do when they are stressed, worried or have experienced a trauma. We have learned that when kids and adults have the words to name how they are feeling this helps in their healing process. We hope that you will read this book with the kids in your life. Healing and growth happens in the safe healthy relationships that we build with kids. Understanding freeze, flight and fight can allow for new conversations about how your child feels and what to do to help them manage their big feelings. This storybook was created in collaboration with the Canadian Centre for Child Protection. We would like to thank the Centre for providing the design work and helping us write the story. It is another tool to help us become more trauma-informed in our relationships. The Webinar is free and available to watch anytime. It is a condensed version of our full day workshop. The webinar Making Sense of Trauma: Practical Tools for Working with Children and Youth was created in association with the Manitoba Trauma Information and Education Centre (trauma-informed.ca and trauma-recovery.ca). Trauma is pervasive and impacts all of us, children and adults. Becoming trauma-informed helps us when working with children to shift from saying "what is wrong with you" to "what has happened to you". The webinar will help you to understand the patterns of children's behaviour and to learn some practical tools to begin helping children to manage those behaviours. Kate Kiernan, M.Sc., is a clinician at the Families Affected by Sexual Assault Program for New Directions for Children, Youth, Adults and Families in Winnipeg. 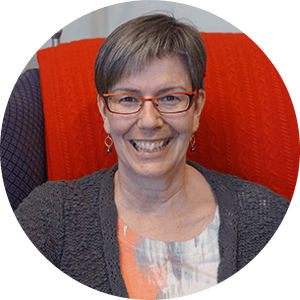 She has over 25 years’ experience working with children and youth who have experienced trauma. 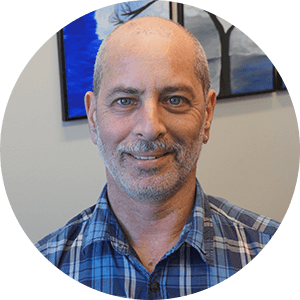 Billy Brodovsky, M.S.W., is a clinician at the Families Affected by Sexual Assault Program for New Directions for Children, Youth, Adults and Families in Winnipeg. He has been working with children and youth who have experienced trauma for over 25 years. Both Billy and Kate are particularly interested in assisting adults to better understand the impact of trauma on children as well as on themselves. The Making Sense of Trauma webinar was developed from a one day workshop that Billy and Kate have been presenting to foster parents, Child & Family Services workers, and other professionals working with children and youth in Manitoba. This webinar succeeds in providing a clear and helpful understanding of trauma and its effects. It provides the caregiver with practical skills and ways to conceptualize trauma that will be immediately effective. This trauma training webinar is accessible for all; caregivers, front line workers, and therapists.